As a child, I had heard from the family elders and priests, about Madurai Meenakshi Temple and Rameswaram and the importance these religious places hold. Since, we were near Coonoor ,in the state of Tamil Nadu, we decided to pay our respects at both these places. So, in October, we drove down from Coonoor to Rameswaram via Madurai. We started at 5:30 am and reached Rameswaram at 3 pm, with two halts, one each for breakfast and lunch. At Rameswaram, we stayed at Daiwik Hotel, which at the time of writing was the only 4-Star hotel at Rameswaram (there are no 5-Star properties here). The hotel is clean, had ample parking space and our package included breakfast as well, although we had all our meals here. Of course, being a temple town, or perhaps it was hotel policy, only vegetarian fare is available. The hotel is near the bus-stand (landmark) and is about 3 kms away from the main temple at Rameswaram. I suggest going to the temple in an autorickshaw if your hotel is far away. Don’t take your vehicle through the narrow lanes and bylanes with a run-down ground for paid parking. Once you reach the temple area, the security will not allow any mobiles / cameras etc – the solution is to keep it in one of the nearby shops who charge Rs 10 (as of Oct 2014) for safe custody…talk about business opportunity! The temple is open from 5 a.m. till 9 p.m. and closes in the afternoon from 1 p.m. to 3 p.m. Once inside, follow the signs to reach the main shrine. You might see most people moving around in wet clothes…these devotees go to all the 22 wells or holy tanks, signifying different theertham / teerth and bathe before praying to the Lord. It takes about an hour to complete all of these tanks. A guide will be able to take you to these theerthams in the right order. Don’t pay for quick / premium service, which usually means extra cost. This bathing ritual is NOT mandatory. In the main shrine, there will always be long queues, no matter when you go because this is one of the 4 sacred places in Hinduism (Char Dham), which one must visit in the course of your life on earth. Either you can get in the queue, which can take hours or you will be approached by some enterprising pundit (priest) or his tout with an offer of ‘premium / express’ darshan! So, we paid Rs 500 for 3 persons and were ushered right in front of the ‘sanctum sanctorum’, where the priests seated us and we could see the Lord in his full glory. During the puja / ritual there, the priest asked for some dakshina, which I paid grudgingly – my wife later told me to calm down saying our intentions are pure…I agreed and moved on. Cleanliness? Nope. Facilities? Nope. Confusion? A lot. Our tourism department and / or the temple trust has a lot t learn from their counterparts elsewhere on the globe. For more information on Rameswaram temple, go to http://www.rameswaramtemple.tnhrce.in. After the darshan, we went around admiring the amazing architecture. We also went to the small beach (if it can be called that) behind the temple and it was stinking with lot filth thrown by the devotees. Shame! There are other attractions nearby – notably Dhanushkodi beach & temple and Ram teertham. You can hire a 4×4 vehicle to take you to Dhanushkodi. This will take about 2 hours or so. After our trip we took our stuff, headed to the hotel and checked out for our next destination, Madurai. Madurai is about 170 kms from Rameswaram and takes about 3 hours or so. The road (NH 49) for major part is good and has some restaurants along the way. Madurai is one of oldest continuously inhabited cities in the world. Meenakshi Amman Temple is a historic Hindu temple located on the south side of the Vaigai River and it is believed that Madurai was built around this temple. 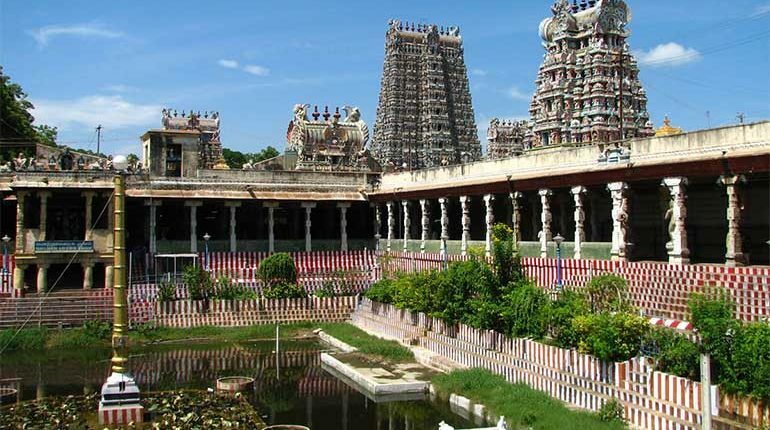 Meenakshi Amman temple is dedicated to Goddess Meenakshi, an avatar of Parvati, the consort of Lord Shiva. The name ‘Meenakshi’, meaning ‘fish-eyed’ is derived from ‘Meen’ (fish) and ‘aksi’ (eyes). The temple has its fair share of visitors and increases on Fridays. Worship hours are from 5 a.m. to 12.30 p.m. & later 4 p.m. to 10 p.m. There are various gates / entrances to the temple. After a security check, you enter the temple complex and head towards the main shrine. 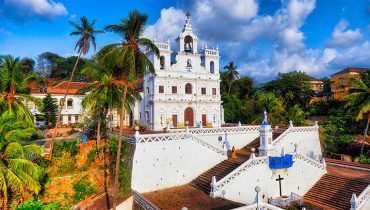 There are various counters which will offer tickets – almost everyone gets the Rs 100 express darshan…but then you quickly realize that you are in a queue that is still serpentine! Anyway, after 2 hours or so, you reach near the ‘sanctum sanctorum’ and then hurried through by the priests – you get less than few seconds to glimpse the deity. After this, you can also pay your respects at the Sundareswarar (Lord Shiva) shrine and then take prasadam in form of laddoos and other sweets. In this temple too, there are large crowds, confusion and heat…all of which feels like a penance. But in the end, it is worth it. One point I need to add is that in our travels in India and abroad, I find that our temples, which are our heritage need to really learn about management of tourists / devotees from their peers abroad, especially the Europeans. Even crowded places like the Vatican are well managed. I hope the tourism ministry takes note and makes the ives of devotees and tourists easier.